Building patios is hard on the body. Too much bending, awkward lifting, and the wide spread of the stone amplifies the weight of the stone; building walls is much easier on your back. I feel like I could build walls until I’m sixty, but there must be a limited number of patios in my back. So a couple of months back I made a decision to build only 40 more flagstone patios in my life. That number is exactly as subjective as it sounds. It should take me 6 or 8 years at the rate I’ve been going. Last year I built only four, but I did three in the last two months, which was too many in a row. This was the second, built the way we do patios for clients, as opposed to the way we built the patio for our own home. The client patio has a layer of weed cloth, three inches of drain rock, more weedcloth, then 2″ thick flagstone set in three inches of gold path fines. 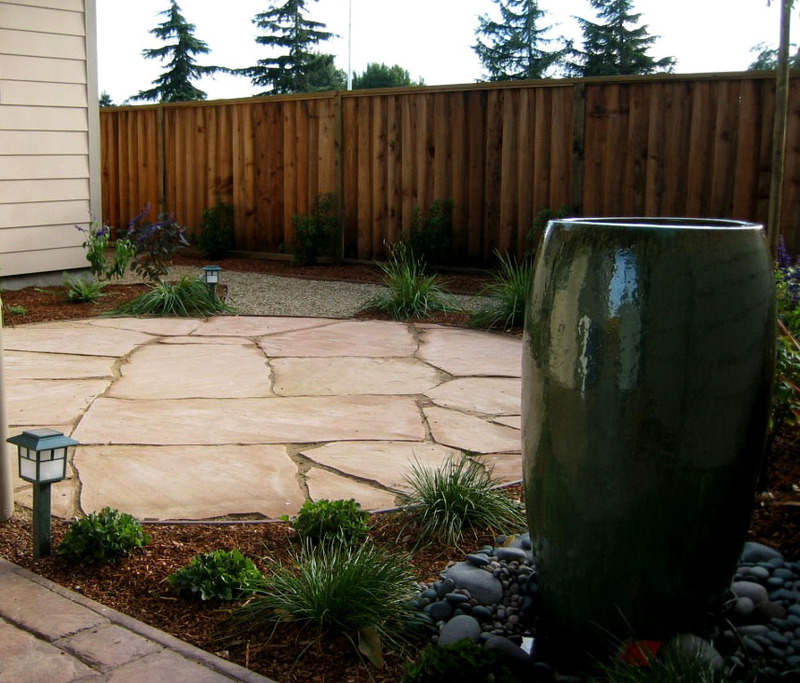 Both the patio surface and the underlying hardpan are gently graded away from the house. Add a bench or bistro table and chairs, turn on the water feature, let the plants grow in, and take another photo. This entry was posted on Monday, January 5th, 2009 at 9:53 am and is filed under flatwork, stone. You can follow any responses to this entry through the RSS 2.0 feed. You can leave a response, or trackback from your own site.